One of my favorite purchases from past Currently Craving posts is the Babyliss Pro Steam Flat Iron. I had no choice but to pick it up on Amazon after reading all the wonderful reviews. Before finding the Babyliss, I was contemplating getting a Maxiglide Iron but was a little turned off by the iron's teeth. I've used the iron about 5 or 6 times and so far I'm pleased. Of the four flat irons I currently own, the Babyliss gets the most love. The iron itself has a small reservoir (and a backup) that I fill with water. I've been using acid water (low pH) to help further seal the cuticle layer. 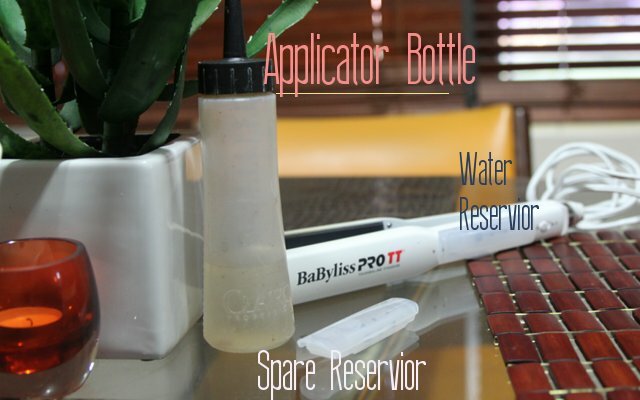 The hole to the reservoir is kinda small so I found that it's easiest to fill using an applicator bottle. The Babyliss Iron has these retractable rounded "teeth" that are supposed to act like a comb to help smooth the hair. Honestly, these things are so un-intimidating that my hair doesn't notice if they are up or down. 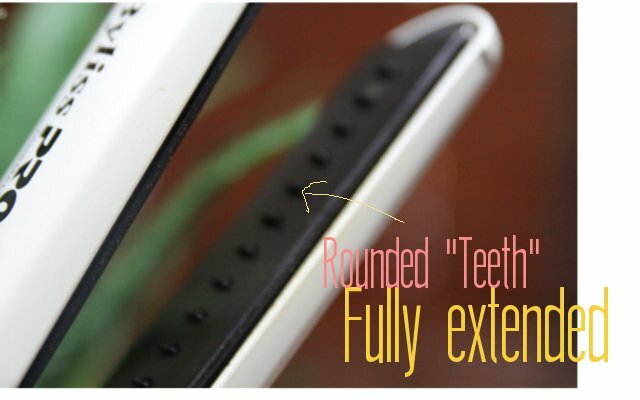 You can have settings on the iron to either hide the teeth, put them up half way or have them all the way out. As you can see in the pic below, having them all the way out is no threat to my hair. Then there are the steam settings. No steam, low steam, or full steam. I bought the iron for one specific thing only, the steam, so rarely does that button move from the highest setting. I used the iron this weekend at nearly 3 months post. This time I chose to do an experiment to see if the steaming action of the iron was really making a difference. I straightened a couple of sections without steam to see the difference between the other sections with the steam. There were a couple of differences, first, the number of "passes" of the iron over that section reduced from 2X to 1X. Secondly, I didn't have to use a comb or brush (i.e. the chase method) for additional smoothing. Without the steam setting, I needed to apply additional tension to achieve straighter results. 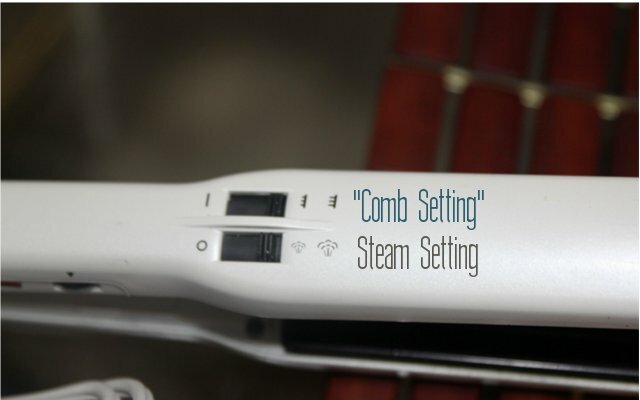 Along with straighter hair, the steam also created softer hair. Each section I did using steam felt a bit more moisturized. The thing with flat irons is that they normally strip moisture from the hair. This iron is employing ionic steam to help loosen the texture, heat to open the cuticle, then pressure from the plates to smooth the follicle. Unlike my Caruso steamer, this iron doesn't saturate the hair with steam so there's no fear of my hair feeling wet or damp afterwards. Damp hair invites frizz. With this iron, there is no such thing. I have absolutely, positively no regrets with this flat iron. The only "negative" is that there are no temperature settings. Instead, the settings are numbers ( I think 1-40). There may have been a manual that tells me what setting the numbers represent but I lost it so, for now, I just keep it at a lower number. Next time I flat iron, I'll test the iron first with a piece of paper. They say that hair and paper burns at the same temperature (451 degrees). This iron goes up to 465! So it's important to test before I use (especially if I place on a higher setting). The temp setting thing is one drawback, the other is how soft and smooth your hair becomes after use. This has the potential to give us a false sense of security about the dangers of using heat because steam is involved. Truth is, I still limit the use of this iron even though it feels "healthier" on my hair than the others. Steam or no steam, at the end of the day, it's still a flat iron and I need to respect that. This iron is the second best hair related purchase I made in the last six months (Micromist is in first place). Even though I love this iron dearly, I've still got my eye on a quality infrared iron as a gift for my hair in the future. p.s. I just went back and reviewed the product video for my Babyliss Iron and learned that the iron does indeed have infrared technology! How awesome is that?! That must be why I like it so much. Im really trying to stay away from direct heat this year, would you recommend this tool for someone like me. Thank you so much for your blog. It's AWESOME! @ Frankie: This iron isn't good for you if your goal is to move away from direct heat. At the end of the day, it's still a flat iron. But, if you plan on using heat sparingly, this iron does a really great job. I picked up this iron when you first mentioned it a couple of months ago. Prior to purchasing this flat iron my hair has never been flat iron. I plan to use it to loosen my coiled new growth every three months. My first time was a bust...I was scared of the heat so I used it on the lowest setting #1. My next purchase will be a ceramide packed heat protectant and I will try again in three months. I'm glade I followed "your" instinct! Thanks for the timely information. I am trying to practice roller setting but it would be nice to have this to fallback on. Your hair looks wonderful. Great post! Your hair looks amazing! Please do an update on your hair. I can't wait to see hw it s doing currently because it looks like its thriving beautifully. Your hair is proof that using heat responsibly can give you great results. I am going to purchase this iron in the near future because I feel like my iron is damaging. Great review. I plan on purchasing this iron too. Has your opinion of the iron changed at all since this posting? @ Anon, My opinion hasn't changed at all. Although I don't use it much, I would say that it's my favorite of the 4 irons I own. Great review. I just buy this for my wife. Thank you! reading your review encourage me to bought this but before i do that i need your help, i read so may complains about its steam doesn't work most of the time, is it true or just rumor? 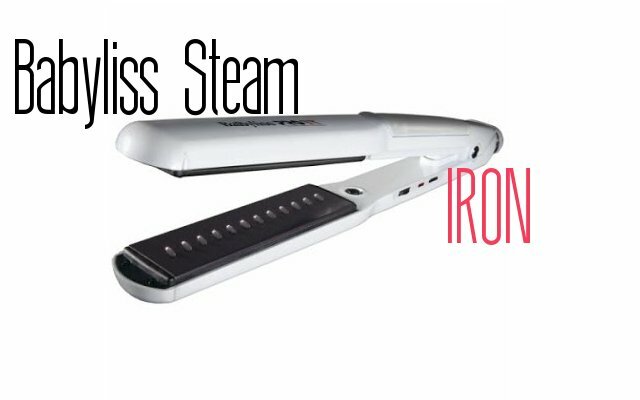 best flat irons with steam I know. Can't find anywhere to buy this bland. Any help?? Thank you for this great and informational post . Now I can understand Again that Babyliss has strong power on the market and one of the best tool for hair care . Thanks for the review but Karmin is my preference. The Water Drinking Challenge Continues. Wash Day Ritual: More than a routine.